Digital citizenship is more than just a buzz term. It’s something most teachers know they should be focussing on in their classrooms. We know how important it is to guide our students to be safe, responsible, and productive online. But who is guiding the teachers? Do you ever feel unsure about what you should be covering? Perhaps you’re not sure how much you should be getting involved in students’ digital dilemmas or how you should be behaving online yourself? This post aims to give teachers and schools some quick tips about personal online conduct and also how to navigate internet safety in the classroom. Don’t have time to read the post? Scroll down to find a summary poster. Some are ongoing considerations — like how to create a positive digital footprint and think carefully about what you’re publishing online. Other digital dilemmas can develop over time — such as problematic gaming or internet use. Then there are more acute concerns that require action — examples include cyberbullying, sexting, and accessing inappropriate content. In years gone by, teachers might not have had much to do with what happens outside the classroom. That has changed. We now need to be mindful of our own behaviour outside the classroom, and willing to deal with issues that are thrust into our hands. While I’m certainly no expert, this is an area I’ve always found particularly interesting. I enjoy discussing digital citizenship because it’s so important yet often overlooked or only covered in one-off lessons. I am certain that digital citizenship education doesn’t have to be hard and you don’t have to be an expert. Students and teachers alike are online more than ever before. Mostly, this is a great thing but problems can occur. A proactive approach and a little forward thinking can help dramatically. This is not an exhaustive list and I’d love you to add your own tips, experiences, or resources in a comment! 1) Don’t allow possible problems with internet use stop you from making the most of technology. This applies to both your professional and personal life. Overall, technology is changing our world for the better. Let’s embrace the positives! 2) Be aware of guidelines and policies set by your employer. Different states, districts, or schools will have their own policies so check with your employer. For example, DET employees in the state of Victoria, Australia should be familiar with Using Social Media: Guide for DET Employees and Acceptable Use Policy for ICT Resources. Here is a good example of a social media policy for teachers from the state of New South Wales, Australia. If you’re in Australia, you’ll find links to all the policies for different states on the Office of the eSafety Commissioner site. Outside of Australia? I’d love you to comment with a link to your own guidelines or policies. This might help others. 3) Develop school internet use policies that are specifically for your staff, students, and families. These will need to be revised regularly and you’ll probably find there are resources set by your state/district/department to help with policy development. Make sure all members of the school community are aware of your policies and guidelines. Perhaps you could add snippets to your newsletter regularly in an easy-to-read format? Maybe students could make videos, posters, or other resources to educate the school community? 4) Teach your students about internet safety regularly and authentically. This is not a one-off lesson. 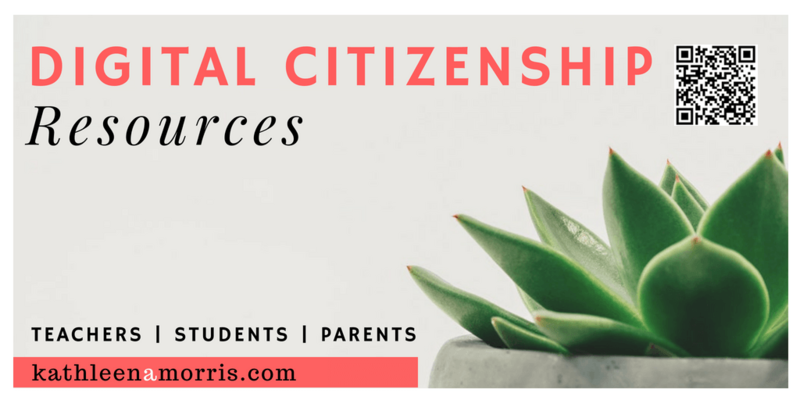 Check out my extensive guide to teaching digital citizenship in the classroom. 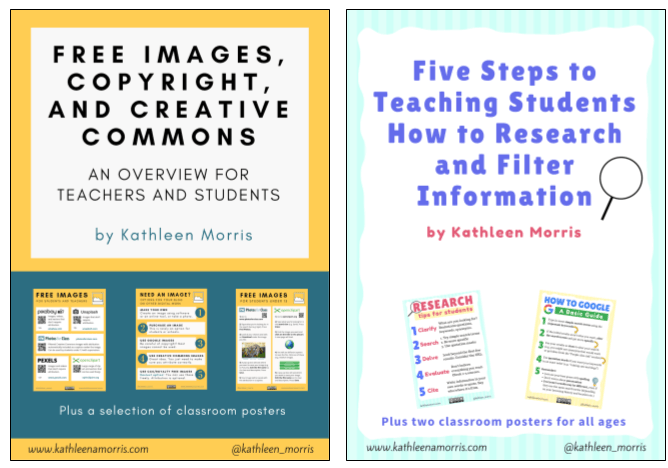 This post includes links to some great resources and a summary poster. I have found blogging to be an excellent way to have an ongoing dialogue about all sorts of digital citizenship issues. 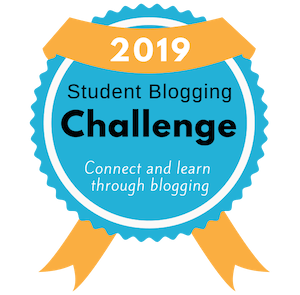 Read more about how to teach digital citizenship through blogging. 5) Teach your students basic internet safety tips and be a role model. 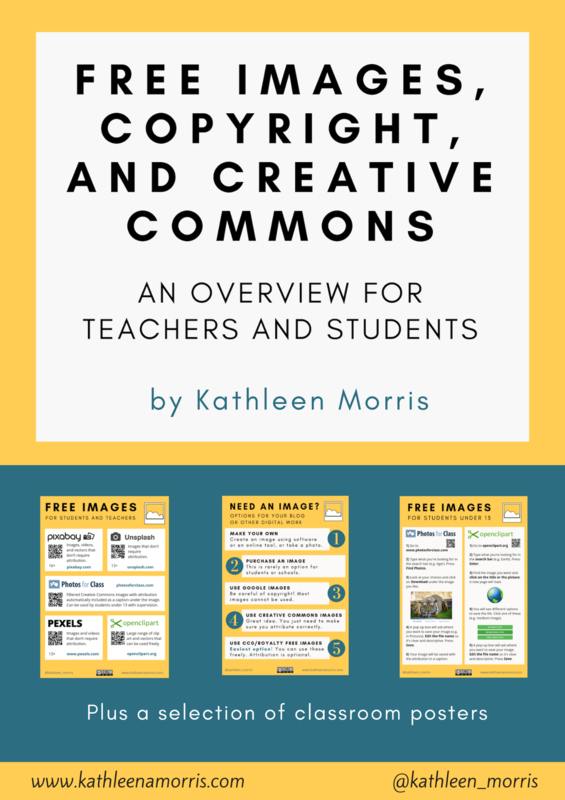 Along with internet safety, students also need to be taught about things like plagiarism, copyright, Creative Commons, search engines, and effective research techniques. These are important areas for teachers and students to know about if they want to use the internet effectively and legally. Teachers have a key role to play as a digital citizenship role model for their class. For example, avoid using images from Google Images in your own work and model to students how you found or created your images. 6) Find out what your students do online when they’re outside of your classroom. If you’re not sure about the online spaces that your students and school community are using, take time to explore and find out how the various sites work. Tip: The Office of eSafety Commissioners has an excellent resource on games, apps, and social networking. Say you hear your students talking about Snapchat or Fortnite or Musical.ly and you don’t know much about it, visit this site to find an overview and answers to FAQs. 7) If students or parents approach you with issues regarding cyberbullying or safe internet use, it’s important to deal with them. You don’t have to go it alone. Get advice and support from your school and possibly your education department. 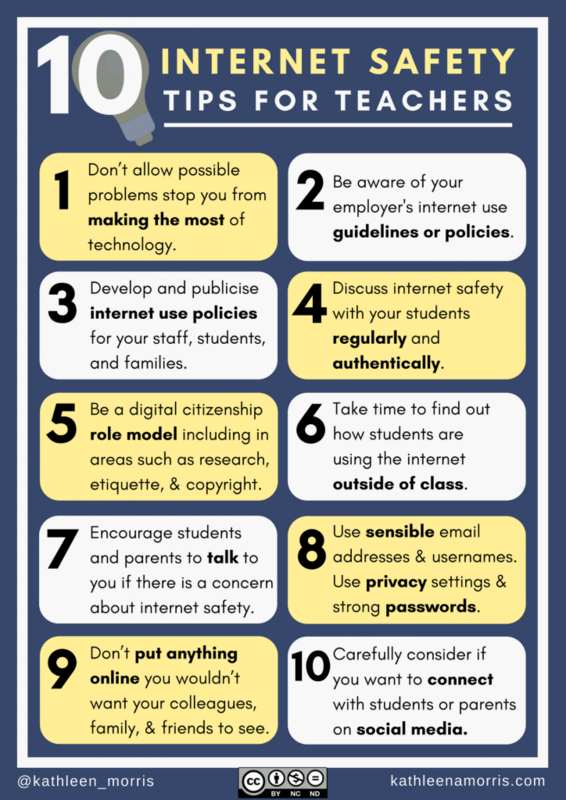 Encourage your students to talk to you about any concerns they might be having with their internet use. All teachers know it can be easier to sort out small problems rather than let them escalate! Choose sensible names for your usernames and email addresses etc. Imagine what parents or colleagues might thinking hearing from [email protected] or [email protected] — innocent enough but not exactly professional. Use strong passwords and change them a number of times a year. I’ve written a post with password advice for teachers and students that you might find useful. Simply put, don’t put anything online that you wouldn’t want your friends, family, colleagues, and employers to see. 99% of teachers realise it’s not nice or appropriate to share complaints, interactions, or jokes about students or parents. Sadly, I still see this happening on social media and I’m guessing I’m not alone? Think carefully about what you’re posting about your students online. The advice here is quite simple — if in any doubt about sharing something, don’t. While it doesn’t give you a licence to publish whatever you like, protect your personal social media or other internet accounts with privacy settings. ICO (a UK independent authority) has a useful resource explaining how to check and change your privacy settings on many social media platforms. 10) Carefully consider whether you want to connect with students or parents on social media. If your account is purely professional it might be fine to connect with members of your school community, but it generally wouldn’t be a good idea for personal accounts. Whatever your decision, consult with your school policies and do not add children who are under 13 on social networks with age restrictions (most social media platforms require users to be 13+ or older). Feel free to print this poster, embed it on your blog, or share it with your colleagues. It’s important that internet safety is regularly discussed amongst staff in schools. Technology moves so quickly. Trends can change dramatically in the space of months. Teachers who are not regular users of the internet, and even some who do use the internet extensively, don’t know what they don’t know. Unfortunately, issues such as cyberbullying, sexting, and problematic internet use are not going away. It’s so important that teachers are equipped to teach about these issues as a preventative, and follow-up issues as they occur. Most of all, don’t be afraid of these challenges. You’re in a unique position to really help empower young people to use technology safely, enjoyably, and purposefully. What a privilege. 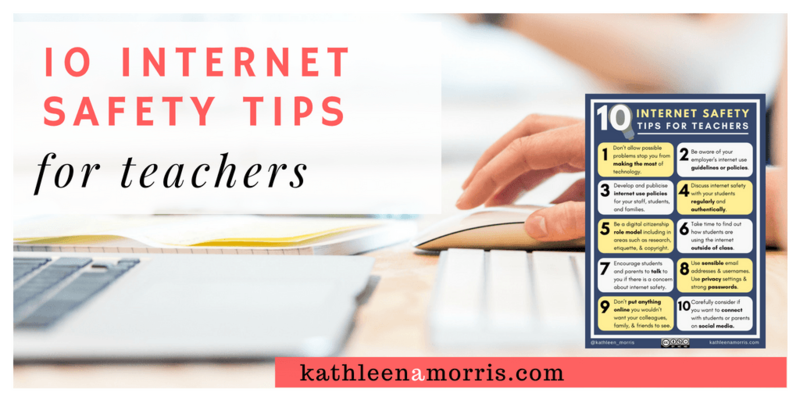 What other internet use tips for teachers would you add? I’m sure there are many more. How does your school help equip teachers to deal with issues around internet safety? I’ve collated my posts about digital citizenship on a page. 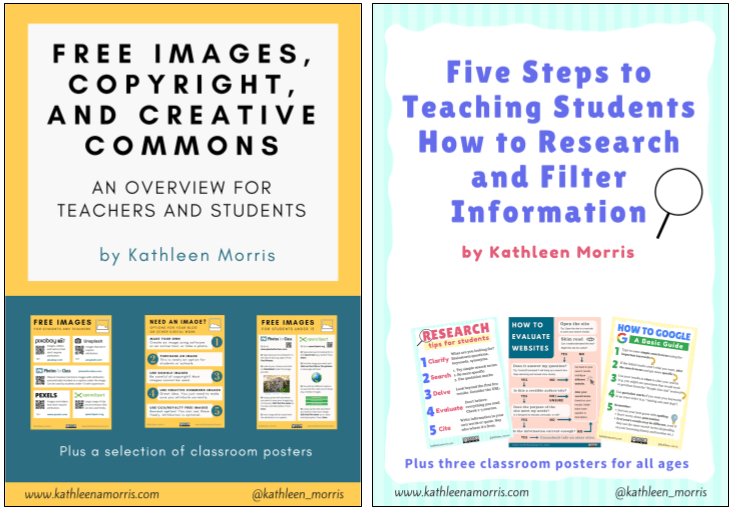 Find more resources and posters for teachers, students, and parents. I have also checked the other infographics and posts related to the topic. Thanks, Tiziana! Hope it’s helpful for you or someone you know!